cology and Toxicology, College of Pharmacy, University of Baghdad, Baghdad, Iraq. ferent with variations in structural features. given in large qu antities, can ha ve desirab le o utco mes . raises concerns about the safe use of dietary flavonoids. mg/kg); Quercetin (50 mg/kg) and Rutin (500 mg/kg). doses of the flavonoids and the vehicle. levels of zinc, copper and iron . (version 5.0, Grap hPad Software, Inc., San Die g o, CA) . 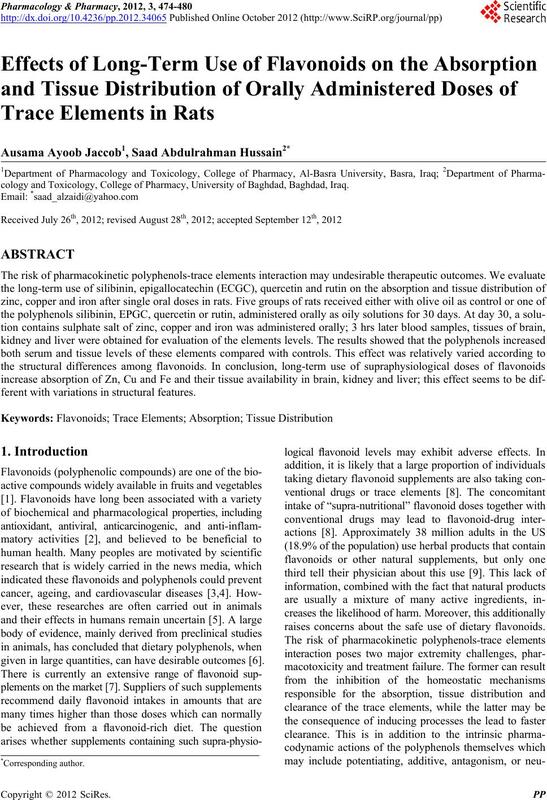 effect of the four flavonoids (P > 0.05) in this respect. EGCG > SDH = quercetin > rutin (Figure 3). after administration of single oral doses of those elements. oral dose of this element. oral doses of this element. oral dose of this metal. 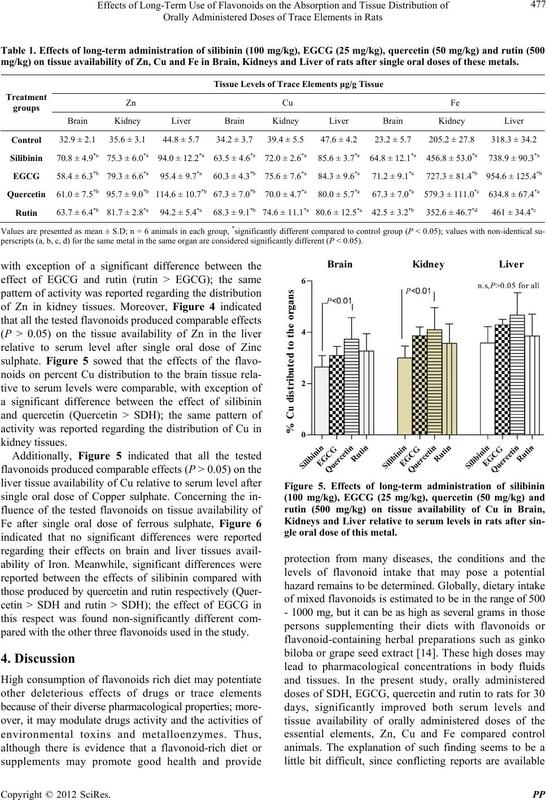 mg/kg) on tissue availability of Zn, Cu and Fe in Brain, Kidneys and Liver of rats after single oral doses of these metals. perscripts (a, b, c, d) for the same metal in the same organ are considered significantly different (P < 0.05). pared with the othe r th ree fl avon oi d s used in the study . gle oral dose of this metal. 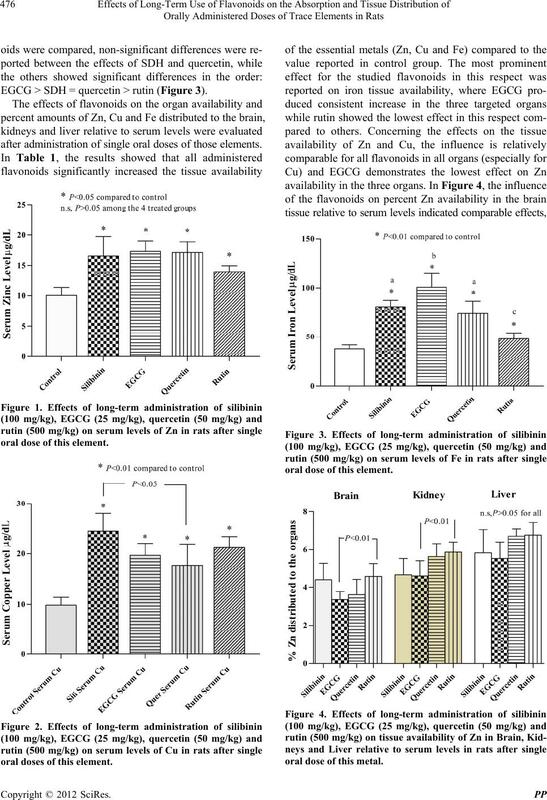 elements (Cu and Zn) and their related enzyme activities. resorption from the gut and transfer to the enterocyte. bility of metals. Some metal complexes are very stable. sorption, the metal may not be metabolically available. lecular Sciences, Vol. 11, No. 4, 2010, pp. 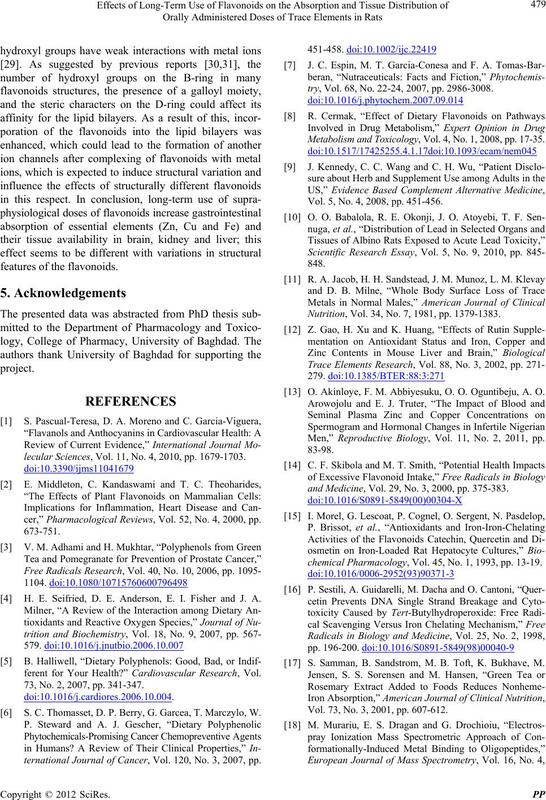 1679-1703.
cer,” Pharmacological Reviews, Vol. 52, No. 4, 2000, pp. H. E. Seifried, D. E. Anderson, E. I. Fisher and J. A.
ferent for Your Health?” Cardiovascular Research, Vol. 73, No. 2, 2007, pp. 341-347. S. C. Thomasset, D. P. Berry, G. Garcea, T. Marczylo, W.
ternational Journal of Cancer, Vol. 120, No. 3, 2007, pp. try, Vol. 68, No. 22-24, 2007, pp. 2986-3008. Metabolism and Toxicology, Vol. 4, No. 1, 2008, pp. 17-35. Vol. 5, No. 4, 2008, pp. 451-456. Nutrition, Vol. 34, No. 7, 1981, pp. 1379-1383. O. Akinloye, F. M. Abbiyesuku, O. O. Oguntibeju, A. O.
Men,” Reproductive Biology, Vol. 11, No. 2, 2011, pp. and Medicine, Vol. 29, No. 3, 2000, pp. 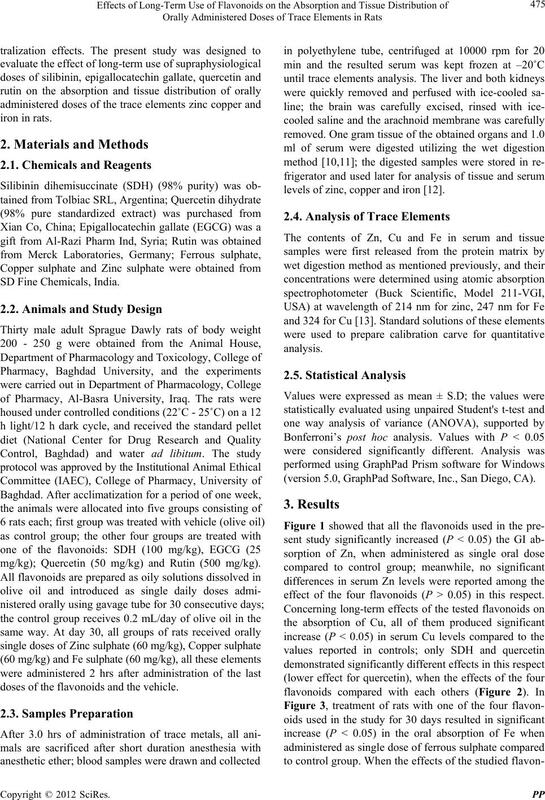 375-383.
chemical Pharmacology, Vol. 45, No. 1, 1993, pp. 13-19. S. Samman, B. Sandstrom, M. B. Toft, K. Bukhave, M.
Vol. 73, No. 3, 2001, pp. 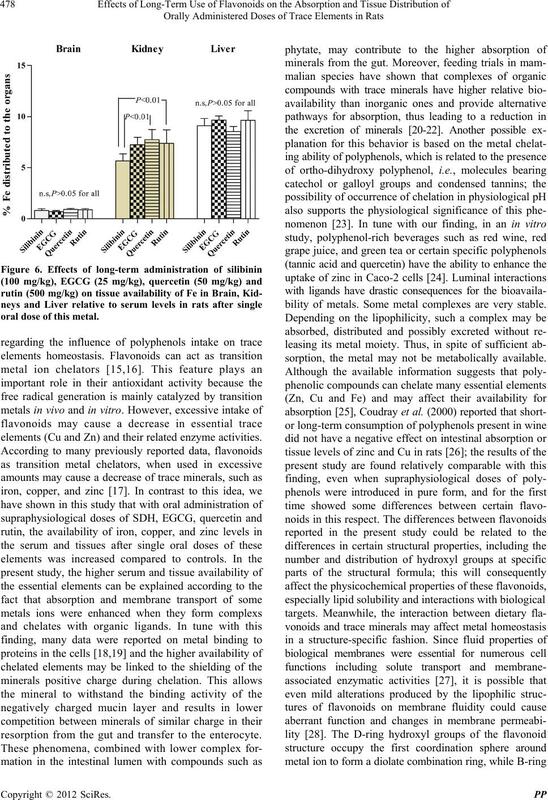 607-612.
ric Model Study,” Biophysical Chemistry, Vol. 144, No. search, Vol. 16, No. 3, 2007, pp. 448-455. Vol. 16, No. 4, 2007, pp. 592-597.
nal of Poultry Sciences, Vol. 8, No. 3, 2009, pp. 291-298. Chemistry, Vol. 98, No. 1, 2006, pp. 23-31. Vol. 75, No. 4, 2010, pp. H123-H128. tion, Vol. 80, No. 6, 1998, pp. 575-584. No. 2, 2005, pp. 885-894. Aires), Vol. 61, No. 2, 2001, pp. 142-146. T. Hashimoto, S. Kumazawa, F. Nanjo, Y. Hara and T.
Bioscience Biotechnology and Biochemistry, Vol. 65, No. 12, 2001, pp. 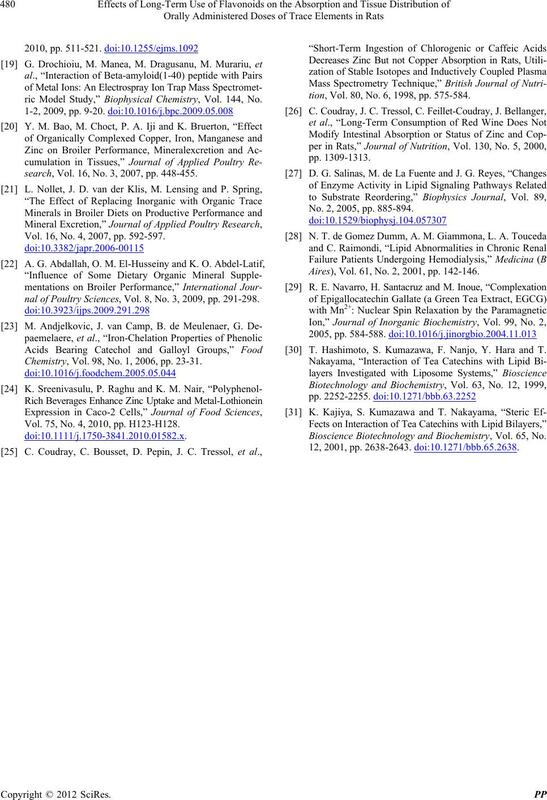 2638-2643. doi:10.1271/bbb.65.2638.